If your Montana vacation dreams include wilderness and wildlife then all your dreams will come true at Bear 'N Crescent Moon. 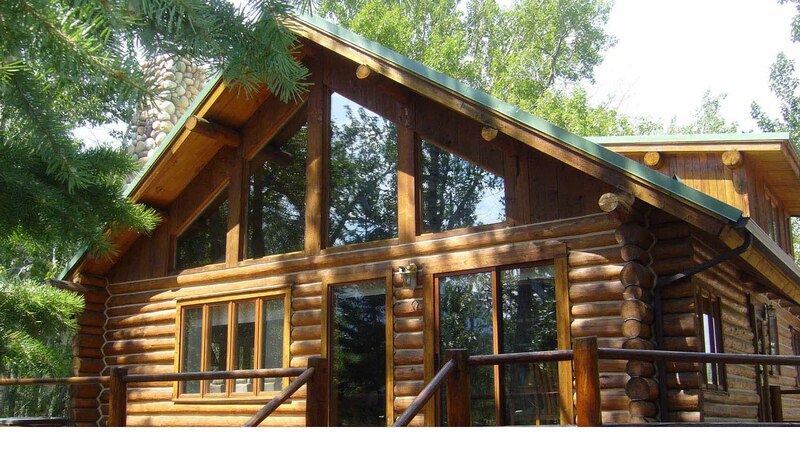 Surrounded by more than 2 acres of pines and aspens, this beautiful 3 bedroom log cabin has lots of privacy but is still just a short 1 mile away from Red Lodge city limits and just 7 miles from Red Lodge Ski Mountain. You are minutes to numerous hiking trails, fishing, shopping, dining, bars, art galleries, museum and our Yellowstone Wildlife Sanctuary. Just South of your cabin you will find the most beautiful drive over the Beartooth Scenic Byway into Cooke City, Silvergate and Yellowstone National Park! You don't have to travel far to see wildlife though. You're sure to see all kinds from the beautiful wood deck while you're soaking in the hot tub. Make sure your hot tub lid is closed at the end of the evening though (there is a reason why it's called "Bear 'n Crescent Moon"). When you're ready for some shut-eye, there are 2 bedrooms on the main level. One has a Queen bed, the second bedroom has 2 twins. Upstairs you will find a third bedroom with 2 Queen Beds as well as a ¾ bath. All your dreams are sure to be sweet at Bear 'N Crescent. AMENITIES: KITCHEN Dishwasher Blender Coffee Pot Mixing Bowls Pots and Pans Baking Pans Toaster Microwave Flat Top Electric Stove/Oven Refrigerator with Ice/Water Dispenser Fully Equipped Breakfast Table with 4 Chairs LIVING/DINING AREA Basic Cable TV 1 TV 1 DVD 1 VHS Additional Dining Room Table with 6 Chairs 2 Overstuffed Loveseats 2 Chairs MAIN LEVEL BEDROOM #1 Queen Bed Alarm Clock Dresser Closet Lamp MAIN LEVEL BEDROOM #2 2 Twin Beds End Table Dresser Closet Lamp Alarm Clock MAIN LEVEL FULL BATHROOM Full Bath UPPER LEVEL BEDROOM 2 Queen Beds End Table Lamp Sitting Chair UPPER LEVEL BATHROOM Shower & Stool Sink OTHER Washer/Dryer Hot Tub Briquette BBQ Great Decks Outdoor Dining Table with Chairs Small Seasonal Stream Kid Friendly Non Smoking/No Pets Minimum Age Limit for Renters NO Air Conditioning Currently there is no Internet Connection. You may use internet at the public library, The Coffee Factory Roasters (along with great coffee and goodies), or you may come to our office at 103 South Broadway. **There is a wood burning stove but not for guests' use. It is closed and for visual purposes only. There is gas forced air heat.